Camping is for camera buffs, too! "oh, Mommy, look at the pretty kitty!" 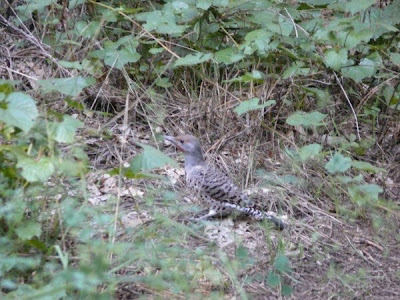 "why, I believe that's the rare gray-headed speckle feather!" 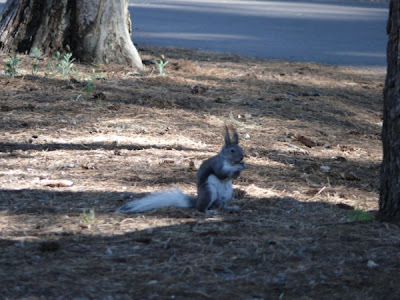 "I used to be a bunny, but now I'm a squirrel, and I'm so confused!" Reprinted by permission from Sharon Falsetto. My earliest camping memories come from my pre-school days. The tent was not fancy, but belonged to Grandpa. It was a tarp type that he used to cover with hay, some ropes for tie down and tie up to whatever trees could be found. Ground cover was also an old tarp. (I think they were WWII-era tarps -- they were smelly when wet.) At that time it was just an overnight camp at some fishing lake. Our only campfire was one we built surrounded by rocks. I remember gathering wood from the nearby woods, as most of the lakes were surrounded by a lot of trees, had small beaches for fishing, and the camping areas were quite rough and often needed clean-up before you could even put up any kind of tent. Food and water were carried in containers from home in hampers -- canned food, as the coolers were not the greatest. We did cook the fish we caught as well. Kerosene lamps and flashlights were a must. Our first tent with a ground cover was quite a step up! So, too, were sleeping bags instead of blankets, then the propane camp stoves and other camp equipment. The poles and pegs were a great improvement, too, as it allowed us to pitch a tent in places without handy trees. 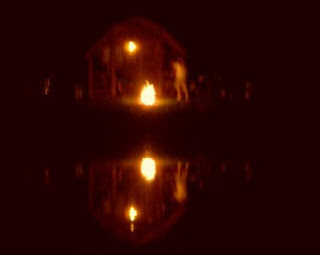 A great memory: The fireflies winking in and out of the campsite and the sounds of crickets and bullfrogs calling. Backwoods camping in remote areas made some of the best memories. We were on a camping canoe type trip where we had to portage between waterways. Small tents, sleeping bags, all water and most of the food had to be carried -- so it was definitely a survival-type camping trip. 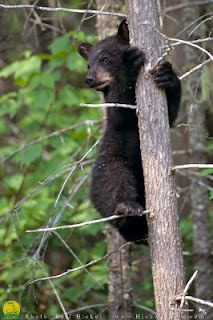 It was in the very early hours of the morning when the black bear wandered into the camp. 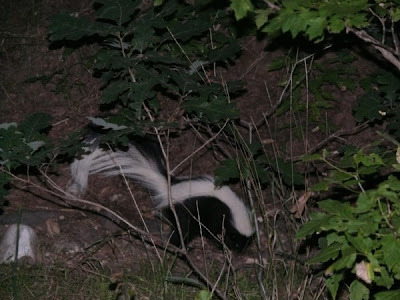 The snuffling noise woke up most of the group (about 8 or 9 of us -- don't recall exactly, but small group). Flashlights and lamps were lit in the various tents, and I could hear quiet voices. "What should we do?" and "Is it a cub or grown-up?" "Should one of us get out and scare it away?" It grew quite hilarious until one of the guys yelled out, "bark!" Next thing you could hear were barking noises from the various tents. Looking out, I saw the poor young bear (probably a year old and alone) running to the nearest tree. In the morning, as we loaded up the tents to leave, one of the guys asked, "What happened to the bear?" Our camp guide pointed up into one of the trees. There it was, stretched out on a limb, not quite asleep, but definitely treed. The camper van, actually an older Econoline van, worked well with our tent camping -- tents for the boys. We pulled our van into a fishing campground after putting the boat into the water and tying it to the dock. We found a good spot to put the van and set up the tent beside it for the boys. Other camper-type vans and tents soon joined us.Along came a tent guy (actually two brothers) with brand new gear, new boat -- the works. They set up their tent, and we all told them -- not a good place to do so. Iit was a creek bed area, mostly dry during the year, but...) These two 'city slickers' just laughed as they said they had the flattest area for their tent...yadda yadda yadda. Of course, the second evening of camping we had a little rain. It was very difficult not to laugh at the 'city slickers' who had to make a very hasty move when the little rain sent water down the creek bed. We all helped them retrieve their 'floated away' items. The cooler was almost half way across the lake. (Good thing it was tightly sealed!) Rain cleared out by mid-morning, and fishing was quite good, amazingly. Since we are talking about camping and fishing, there is a story from a little lake called Trumble in northwest Iowa. This lake is somewhat strange as a ridge runs across one section of it. You can actually wade halfway across the lake and continue fishing. There is a very rustic area where you can camp on the point near that ridge. 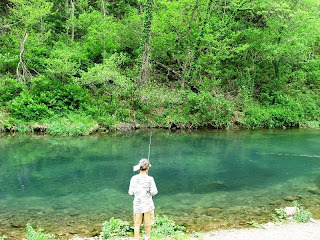 We were there for early spring bullhead fishing. The tent was small, but fit our needs as we spent most of the time fishing anyway. Worms don't bother me. Fact is, when I was younger I had a night-crawler business of my own. I'd go out with a flashlight and pick worms. Those went into an old fridge in special plastic box containers with a mixture of buss bedding and newspapers. Some were sold, and some used by our family. So putting a worm on a hook was nothing new for me, and fishing and camping were things that went together. I've caught logs, shoes, tree branches -- and on that occasion, someone's lost stringer of fish with 8 live fish on the stringer. Some had probably escaped the stringer, but it was an odd day. It got funnier as the day went on. Mom was barely five feet tall. She and Dad were fishing on one side of the point, and suddenly I heard her yelling for help. My two younger sisters and I ran back across the point to where we found Dad laughing and laughing. There was Mom, her line going out into the water, and she was being pulled INTO the lake. Out from shoreline was a snapping turtle quite obviously hooked on her line. It was huge! Dad just stood there and laughed, telling her to cut the line; and Mom being stubborn said NO! The struggle went on, with her being pulled more than she was able to pull back. About this time Dad realized that Mom was not going to give up, so he went over to help her pull in that snapper. He could not pull it in either! Then the ranger came around and, seeing the situation, went back to his car and got a gaff hook and waders. 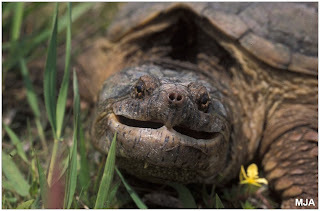 When they finally got that snapping turtle to shore we all stood back in amazement. It was the biggest one I'd ever seen, and the biggest the ranger had ever seen. The ranger killed it with an axe, and put it in the back of his jeep to take back to his park office to display. It was there for many years until the office was destroyed in a fire in the 1980's. After the snapper bit, we found the fishing was greatly improved. Later that day the ranger returned and presented mom with the clean front claws of that snapping turtle. Mom strung them together with fishing line and would often hang them on our main tent pole when we went camping. Memories -- wonderful ones of childhood years and camping and fishing with Mom and Dad and my two younger sisters. Reprinted by permission from Cherry Kelly. When we say that a campground has something for everyone, that might be seen as a tired cliche. It's just a statement of fact, however, in the case of Canandaigua's KOA Kampground. KOA USA has modeled itself as the McDonald's of campgrounds: "you always know what to expect, wherever you may go." While honoring the premise, I'll politely disagree with the reality. Every camping resort is the sum of a whole slew of variables, and not all of them are easily repeated regardless of location. Most franchise campgrounds start out with a somewhat tacky entrance, and this one is no exception. The Jellystone resorts we visit present this same face to incoming campers. Once you get past the main office, pool, mini-golf, caf, and arcade pavilion you'll find a far more serene camping experience awaits. Despite its commercial front, this KOA even offers wooded no-services tent-sites for the more adventurous. This is no roadside RV Park. The people make the real difference. 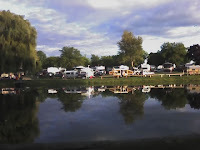 Canandaigua's KOA is locally owned by some of the nicest people I've met. It's a busy place, but they're always happy to see you walk in the front door to register. And if you have any problem at all, the staff will jump through hoops to find a solution for you. As for the basics, you'll find everything you might want. The camp store is bright and well-stocked, and you can buy prepared food at the Kafe out back. The pool is big enough, well-policed, and offers sun or shade as you like. Restrooms and showers are modern and cleaned faithfully every day. Your kids will enjoy the video arcade or miniature golf; or they can rent cars or boats to pedal. Courts for shuffleboard and horseshoes are up front, by the pool. There's room farther back for volleyball and basketball, too. 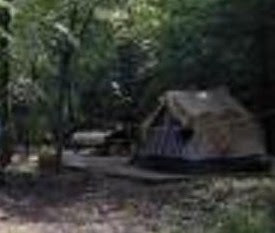 Back in the woods there are biking and hiking trails, an obstacle course, tree house, and zip-line. You can even fish in the pond (catch and release). In the end, it's all about your campsite. This KOA offers over 120 sites in seven distinct sections, ranging from full-service to primitive. The big rigs park in pull-throughs, with smaller set-ups like ours scattered throughout the campground. You can camp in circular groups, or choose a corner spot under a big tree. If you came with only a car and sleeping bag, you can stay in comfort in one of the dozen assorted Kabins or Kottages (very nice!). 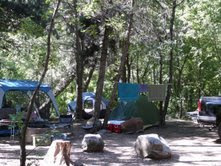 Tent campers can choose from grassy middle-of-it-all sites to a secluded clearing in the woods. 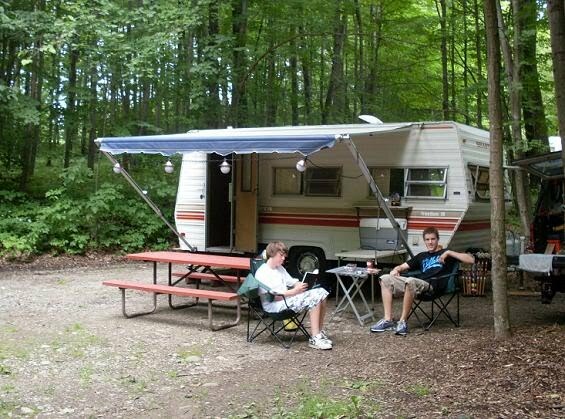 Whether you're touring the country in a giant Class-A motor home or carrying a tent in your Honda's trunk, you'll find a fine site to spend the night or a week at KOA Canandaigua in New York. Stay the whole time, roasting marshmallows over a campfire; or head out for an all-day tourism spree. Bring your whole baseball team, or just one good friend. There really is something for everyone here. Rating: 4 out of 5 "Recommended"
How about you? 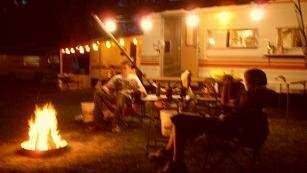 Do you have a campground review you'd like to share? These will be a regular feature here as we move forward. Use this one as a style guide, if you'd like to submit your review for posting here. You can reach me via Comments or by using the link at the top of this page. 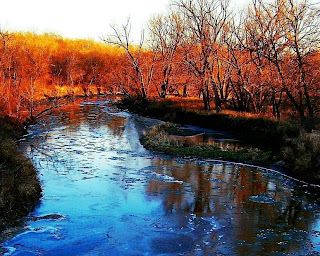 Cherry’s "river through the tent" story [see title link, above] reminds me of the time I went trout fishing along the Turkey River up in northeast Iowa. Early in the night, it started raining. I didn’t know this until there was a clap of thunder and I sat straight up in my sleeping bag. Looking for the flashlight, I discovered a stream of water running through the tent. We weren’t in a creek bed, but it was raining hard enough there was water coming down the hillside like it was a water slide. My backpack was trying to act as a levee and failing miserably. Her husband told her to put them in anything she could find in the car, he wasn’t going back to the tent in that rain, and to go to sleep. What she found was a paper cup half full of root beer, so she said a few more words about sugar, sticky and not being able to see tomorrow. Finally everyone settled down and tried to sleep. When we crawled out in the morning, the river had risen several feet and you could see the line between the clear water and the cloudy water from the rain. A conservation officer (who was a trout fisherman) came around and told us not to try to drive out of there, yet. He said it was the biggest flood they’d seen in a long time on the Turkey River, but it was still good fishing. Just aim for the line between the clear and cloudy water. We decided to give it a try. We had these little red wiggler worms and they really lived up to their name. I wasn’t about to touch one, much less try to thread it on a hook. Don, my friend’s husband, was closest to me and all he would do was laugh. Not being one to give up, I dug in my tackle box until I found a needle nose pliers and picked up my first worm. Holding the hook in one hand (one of those teeny, tiny little trout hooks) and the worm with the pliers, I soon realized that wasn’t going to work. My hand was too close and the worm kept touching me. Again, I dug around in the tackle box and finally came up with a pair of regular pliers. Now I was in business. Taking the hook with the regular pliers and the worm with the needle nose, I set about baiting my hook. This is when Don looked over and saw what I was doing. The next thing I knew, he was half in the water and in danger of falling the rest of the way into the river, due to his fits of laughter. A bit later, with the sun finally shining, we laid out our sleeping bags, and my cloths, to dry. (Yes, I went fishing in my jammies.) We still didn’t dare to move any of the cars, so we rummaged around to find what we could for lunch. That is, to eat with my fish. Yes, I was the one who caught the fish. Apparently they liked the metallic flavor of my worms. Reprinted by permission from Molly O'Shea. Are we nearly done with Perfect Camping Nights? You may know of my obsession with Perfect Camping Nights. When I posted my good-bye to summer recently, I may have jumped the gun. We're more than halfway through September now, and I'm sitting out on the balcony deck (my writing refuge). The peepers are singing up a fall symphony, there's no hint of a breeze, and the temperature is fine for jeans and a sweatshirt. We even had a dandy campfire earlier this evening during Dinner at Dad's (my dad). We've camped before in mid- to late September. Our little furnace pumps out 10,000 BTU's, which is more than enough to chase off a fifty-degree night chill. Most of the campgrounds in our area are open right through the third week of October, often with big discounts. So where do we stand on post-summer PCN's? ELEVEN! Yes, that's right: this "fall" month nearly ties the score with both June and July's tally of gorgeous overnights! One more night like this, and the counts are even. So we might get one or two more trips in yet this year, after all. The weekend forecast isn't encouraging, but there's plenty of potential for a few more beautiful camping evenings yet this year. Tell you one thing, the deer sure love this weather. They're everywhere! I missed one tonight, driving home in the moonlit darkness, by about ten feet. Good thing the driver behind me was paying attention. Who else is headed out for an early fall camping trip? Is this the best time of year for you? Any big leaf-watching trips planned? Aren't they cute? These four appeared to be yearlings out for a morning forage. One more look at them before I let you in on the secret. Guess where this picture was taken. State park? Nope. I was at the shop this morning loading some supplies when I spotted this group of white-tail deer just hanging out nearby. This spot, as "wild" as it might look, lies between our warehouse dock and the neighboring business. These deer are with-in walking distance of the village and less than 100 yards from a very busy street. The next trip was a bit of a wash out weather wise and we came home early so we won't even revisit that one. Moving on... The following summer we decided to get a bit more adventurous and planned an expedition to the North Rim of the Grand Canyon. I say expedition, as by now we had progressed to larger tent and more accessories meaning planning and packing took a little longer than our first carefree trip. their pride and joy. Our neighbors on this particular trip provided me with more entertainment than the weekly soaps. I couldn't figure out if this was their first trip, or just something they always did, but as they spoke little English, this mystery was never solved. Setting up camp now took a little longer, but hey this is what I call camping – well nearly. Bathroom suite would be nice......'Maybe next year', muses my husband. This time I had brought some aromatherapy candles to keep those bugs at bay but......settled comfy and warm in my luxurious multitude of blankets, pillows and comforters, dropping off to sleep, I see a huge spider trying to snuggle down with me. Screaming loudly, I call for my husband, who has stepped outside to use the 'bathroom facilities'. Then, there's the tale about the fish – the one that got away.....so onto plan B, burgers. Except, the meat is no where to be found. After much debate, it is decided that my husband will go back into town and pick up some more. I thought about the shower, the warm water, the hairdryer, all within reach of this.......But, no, I would stay and guard the camp from those critters and creatures lurking in the bush somewhere. How a girl that grew up camping turned into a woman that considered roughing it meant not having concierge service is beyond me, even if I am the girl/woman in question. From as young an age as I can remember I was gathering deadwood, cleaning fish, and so enamored with camping I insisted on sleeping out in the backyard in my tent if we weren't camping. I never realized how much times changed until a few years ago. For a stretch of several years we did very little camping and when we did it was beach camping that generally wound up being more expensive than a weekend at the Ritz Carlton. Everyone wanted to camp with us. Why wouldn't they? After all, how many camped with a mini home entertainment system, gourmet food, and ergonomically correct sleeping pads? I even looked into outsourcing having our campsite set up before we arrived, but oddly enough there was no listing for any such service in the yellow pages. Where did the summer of 2008 go? 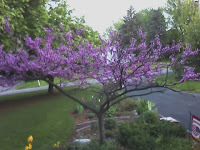 It seems like only a few days ago we were dancing in the front yard, celebrating the early arrival of summer in mid-April. When spring's first brilliant bursts of green emerge, it seems like the summer stretches ahead with endless promise. Then, seemingly in a few short days, it's Labor Day weekend. Plans have been made, vacations taken, trips come and gone, yard chores carried out or left undone, and each gorgeous summer day savored during the brief instant of its existance. gathered around the campfire wearing sweatshirts and drinking hot drinks after a blustery Saturday.